D/DBi The Gilbey family record in this collection begins with Henry Gilbey of Bishops Stortford, Hertfordshire (1789-1842). He had several children including three sons Henry Parry Gilbey (1824- 1892), Walter Gilbey (1831-1914) of Elsenham Hall, created first baronet in 1893 and Alfred Gilbey (1833-1879) of Wooburn House, Buckinghamshire, who married Agnes Crosbie in 1858. Sir Walter Gilbey of Elsenham Hall in turn had several children including three sons-Sir Henry Walter Gilbey of Elsenham Hall (1859 - 1945), Arthur Nockolds Gilbey (1861-1939) and Guy Gilbey (1868-1930). Sir Henry Walter Gilbey had a son Walter Ewart Gilbey (1886-1941) and his eldest son was Sir Walter Derek Gilbey born in 1913 of Elsenham Hall, later of Wineham, Sussex. 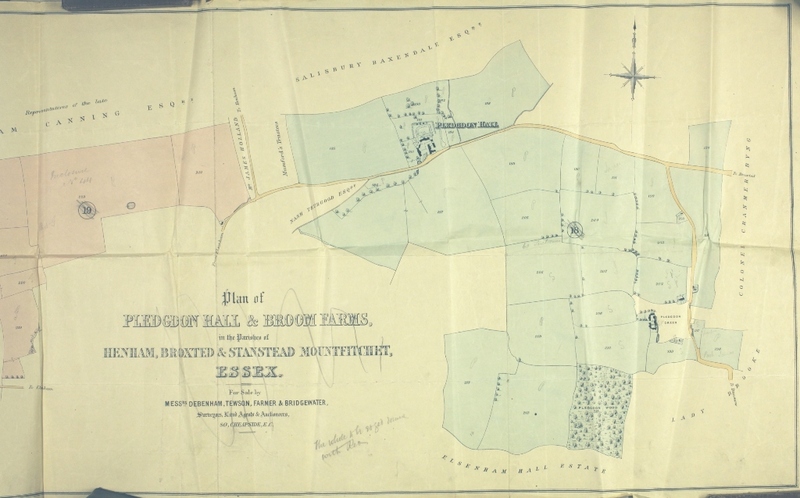 D/DBi T28 1692-1899 Deeds - GILBEY FAMILY Deeds of Pennington Hall Farm, 2 acres land in Catts Lane, 2 1/2 acres called Sloebush in Outfield and part of Sandhill Field, arable land called Saffron Garden, all copyhold of manor of Pledgdon alias Prison Hall, HENHAM and a house, butcher’s shop and yards in Elsenham. 26th Jan 1856 - Will of James Orger who appoints his wife Mary and sons George Orger and William Orger to be executors and trustees. James gives a butcher's shop, buildings, yards, gardens and a small piece of pasture ground to his eldest son George subject to an annual charge of £26 to be paid to Mary plus a payment of £400 to his executors at the death of Mary. 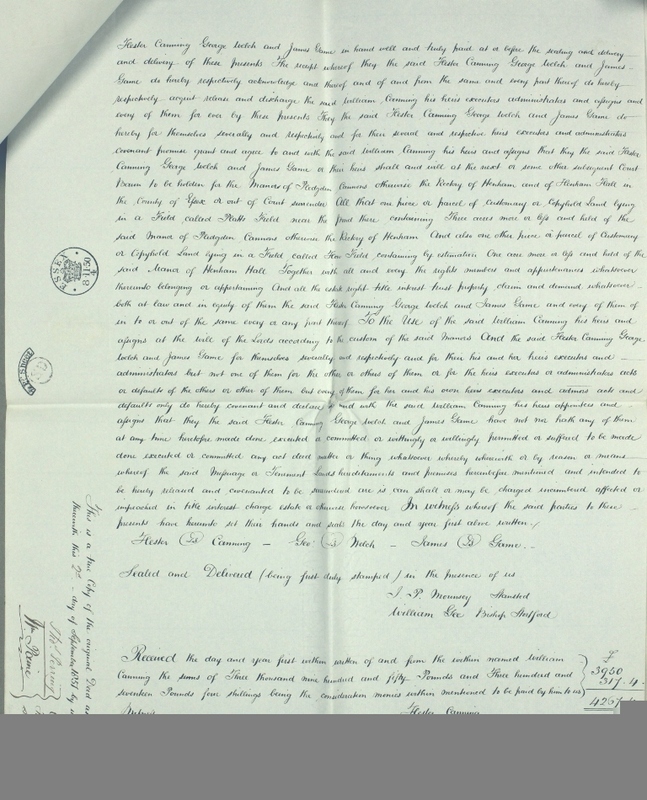 James leaves the rest of his estate to his wife Mary and sons upon trust to farm and cultivate his farm called Pennington Hall during Mary's life and for the executors to occupy it. Proved 16th June 1802. 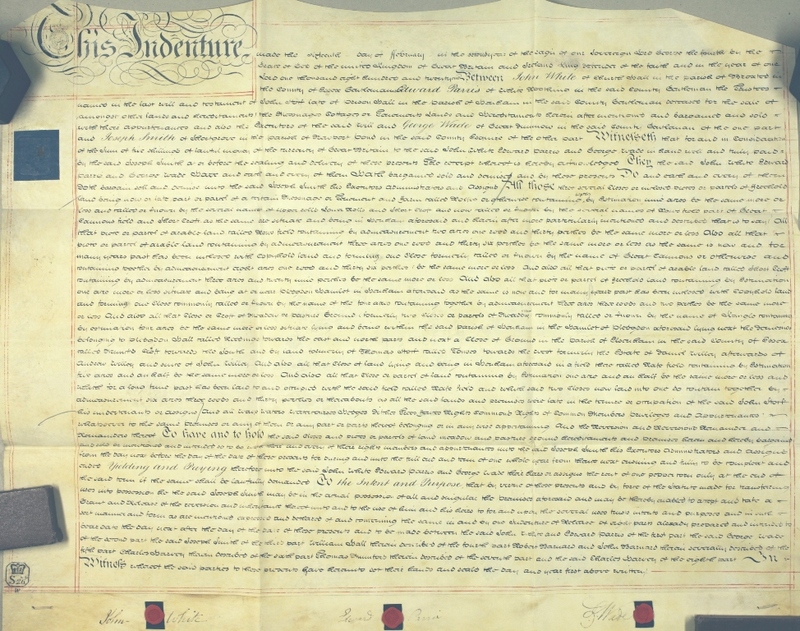 11th & 12th Oct 1774 - the sale under the Will of George Warner deceased to George Lambert. 10th April 1848 - George Warner mentions his friend and neighbour James Orger and daughter Elizabeth Warner. Proved by James Orger and Elizabeth Warner. containing about 11 acres and being in Elsenham in the said county both in the tenure of the said John Stock assessed at £1.8s.0d. making together £8. 8s.0d the property of the said John Stock. The Consideration was declared to be three hundred and eight pounds consolidated or reduced three per cent Bank Annuities by sixteen instalments. Receipt endorsed thereon 1st May 1799 by W Johnson one of the Cashiers of the Bank of England for £308 reduced three per cent Bank Annuities being the full Consideration. 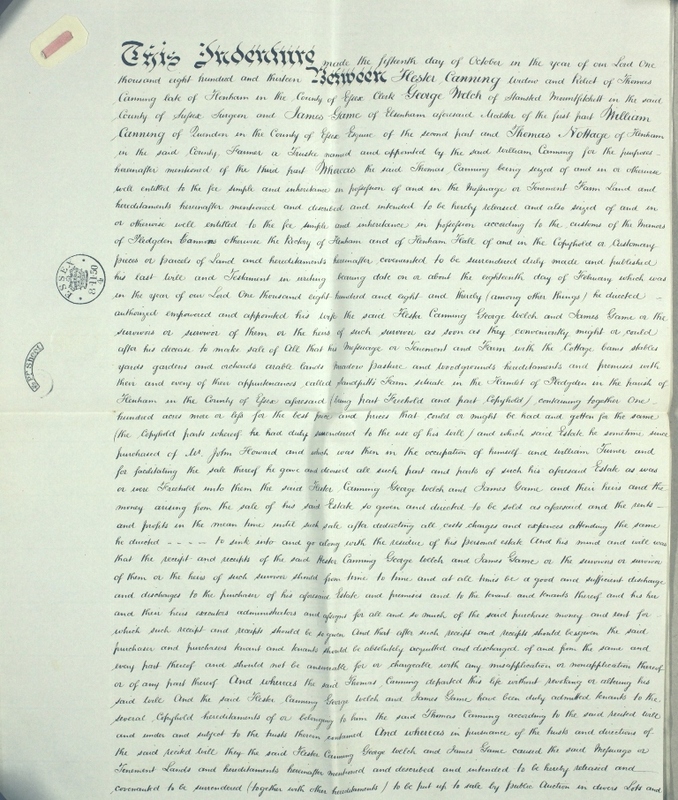 I do hereby Certify that the foregoing is a true Copy taken from the Office Registry the 6th day of October 1893. 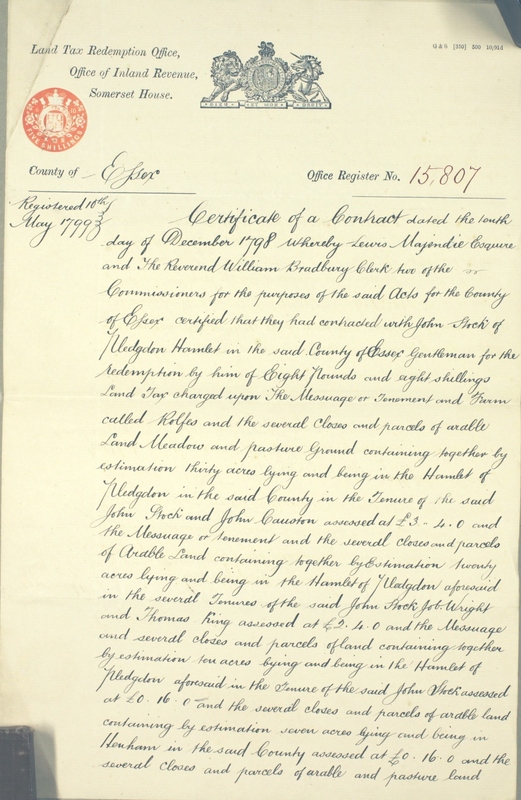 Signed ..Humphney, Deputy Registrar of Land Tax. 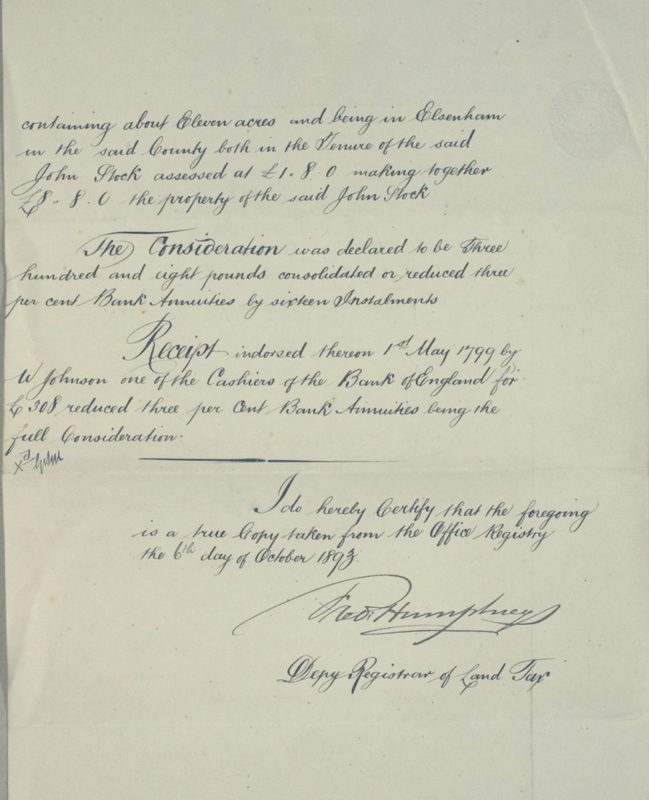 Purchase of the messuages or tenements, lands and hereditaments hereinafter mentioned, bargained and sold. Now this Indenture Witnesseth that in order to marry the said Trusts and the true Intent and meaning of the said Testator intentions as far as in them the said John White and Edward Parris in hand... and truly paid by the said Joseph Smith at or before the sealing and delivering those presents The Receipt thereof for the purposes mentioned in the said Will of the said John Stork they the said John White and Edward Parris do and each of them doth hereby acknowledge and of and from the same and every part thereof do and each of them doth ... release and discharge the said Joseph Smith and his Executors, Administrators and Assigns for ever by these presents. 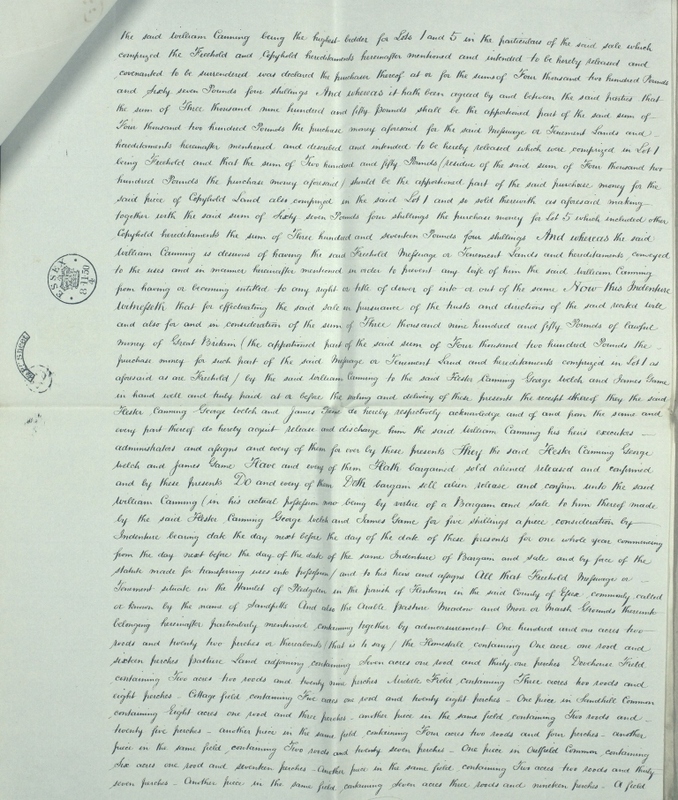 They said John White and Edward Parris Have and each of them Hath bargained and sold and by these presents Do and each of them doth bargain and sell unto the said Joseph Smith, his heirs and assigns ALL That customry messuage or tenement commonly called or known by the name of Rolfes with the appurtenances situate and being at Pledgdon Green within the said manor And Also all those seventeen acres more or less of arable land and pasture to the said messuage or tenement belonging situate .. and being in Henham aforesaid at or near Pledgdon Green aforesaid and ... oif the said manor by copy of Court Roll And also all those ... pieces or parcels of land ... in a Common field called Outfield in or near that part thereof which is called Plumbtree Corner containing by estimation three acres more or less with ... appurtenances... and being in ......and holden of the manor by copy of Court Roll and .. the said John Stork took to him and his heirs at a Court ...in and for the said manor the third day of August in the year of our Lord One Thousand seven hundred and ninety five on the Surrender of Mary Groat And also all that customary or Copyhold messuage or tenement called Hubbards And also all those customary or copyhold lands thereunto belonging containg by estimation Ten acres more or less with their appurtenances holden of the said manor by the yearly rent of thirteen shillings and four pence And also all that croft or close of Customary or Copyhold land called A... Croft containing by estimation six acres more or less with their appurtenances holden of the said manor by the yearly rent of five ... by apportionment ... said last mentioned messuage, lands and premises are situate ..and being in Henham aforesaid and are held of the said manor by Copy of Court Roll and whom the said John Stork took to him and his heirs at the said Court holden in and for the said Manor the said third day of August One Thousand seven hundred and ninety five on the Surrender of John Dixon and Grace his wife And also all that customary croft or parcel of land and pasture commonly called or known by the name of Kangle containing by estimation two acres with the appurtenances being within the said manor And also all that piece of parcel of customary land containing by estimation one acre more or less with the appurtenances ....and being in a certain field called Outfield within the said Manor and which said last mentioned lands the said John Stork took to him and his heirs at a Court holden in and for the said Manor the twenty sixth day of September in the year of our Lord One Thousand seven hundred and ninety five under the Will and Surrender to the use thereof of John Willey And all other the customary or Copyhold lands late of the said John Stork holden of the said Manor by Copy of Court Roll and so by his Will directed to be sold as aforesaid and all houses, outhouses,...buildings, barns, stables, yards, gardens, ways, rights, Common rights of Common Members privileges and appurtenances whatsoever to the same premises or any of them or any part or parts thereof belonging or in anywise appertaining and the Reversion and Reversions Remainder and Remainders thereof and all the estate, right, title, interest, inheritance, use, trust, profesdsion, property, claim and Demand whatsoever ..at.. and in equity of those the said John White and Edward Parris and each of them of, in and to the same premises and every part thereof To Have and to hold the said messuages or tenements, lands, hereditaments and premises herein and hereby bargained and sold or mentioned and intended so to be with their and every of their Rights, Members and Appurtenances unto the said Joseph Smith, his heirs and Assigns To the proper use and hereof of the said Joseph Smith, his heirs and assigns absolutely and for ever according to the custom of the said Manor and to or for ...Use, Interest or purpose whatsoever And the said John White for himself, his heirs, executors and Administrators and for his own Arts and Deeds only and the said Edward Parris for himself, his heirs, executors and administrators and for his own arts and deeds only so and each of them doth by these presents... promise and devise to and with the said Joseph Smith, his heirs and assigns that they the said John White and Edward Parris have not nor hath ... of them at any time herefore had made.....or... or willingly suffered any Art, Deed, Matter or Thing whatsoever whereby or by means whereof the said messuages or tenements, lands, hereditaments and premises herein and hereby bargained and sold or mentioned and intended so to be or any part thereof or is ran or may be .....or... in Title, Charge, Estate or otherwise whatsoever In Witness whereof the said parties to these presents have hereunto set their hands and seals the day and .. first before written. 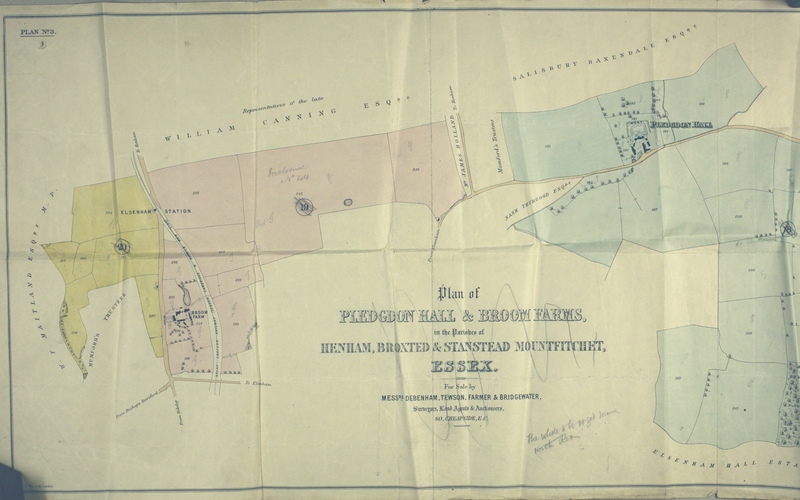 MERCHANTS Deeds of manor of Pledgdon Hall and manor house of Pledgdon alias Prison Hall, HENHAM 241 acres land in Broxted, 33 acres wood in Broxted and HENHAM Abstracts of title, 1817-1892. 26th March 1873 - a conveyance by George Ruse to William Charles Smith of two cottages at Henham for £ 50. 1st Nov 1892 Joseph Charles Thomas to Walter Gilbey of Elsenham Hall. 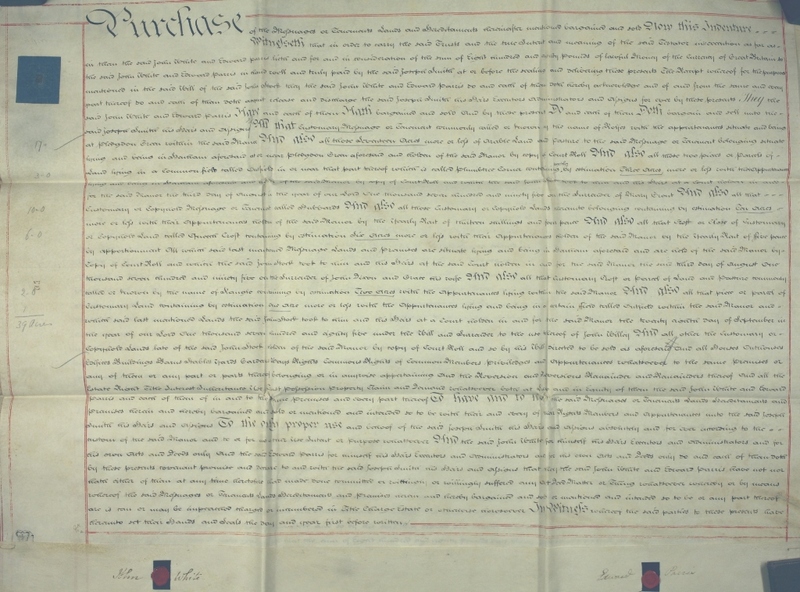 Contract for the sale of Broom Farm and Pledgdon Hall Farm for £11,500. 26th March 1873 - Pledgdon Hall Farm - no. 196 in the Tithe Awards = two cottages and gardens. 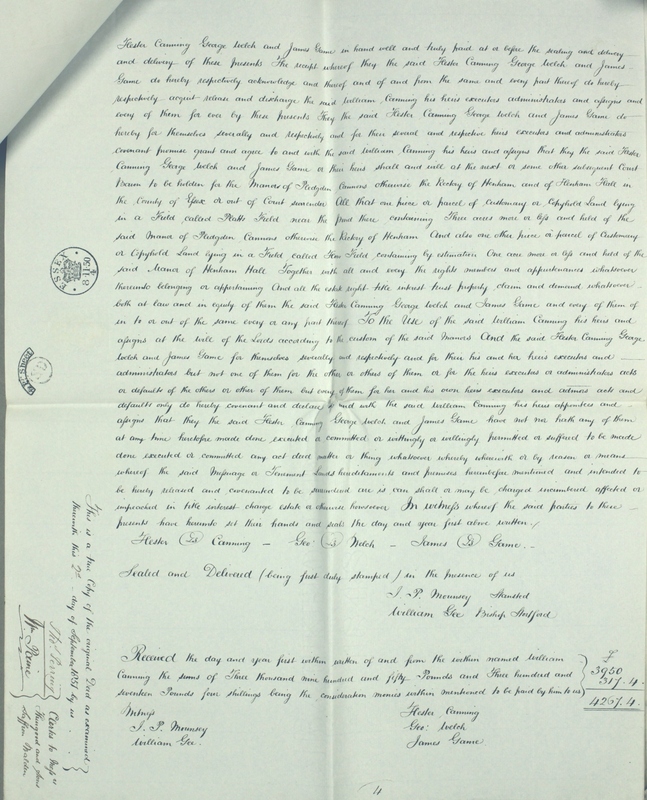 Mentions a conveyance to William Charles Smith. inc tithe plots (Henham) 180,181, 182, 183, 184, 185 - 197, 199-210, 212-223 (193= cottage and garden; 196= 2 cottages and garden; 200=cottage and garden; 202 Rainbow Field and 2 cottages. inc tithe plots (Broom Farm) - 214-223; 231; 224-230; 214 Broom Farm; 221 Butcher; plot 231 in the tenure of representatives of the late Thomas Newport, the remainder is in the tenure of Allen Joyce. 'Emma Nottage the late.... of Battersea, spinster, tenant of Henham Manor, in consideration of £ 40 paid by Benjamin North Ward of Henham - messuage, cottage or tenement with the yard and orchards and gardens in Henham with the appurtenances abutting on Wood End Green formerly in the occupation of Susan Cracknell and John Fuller and then.... late of George Gierson(?) 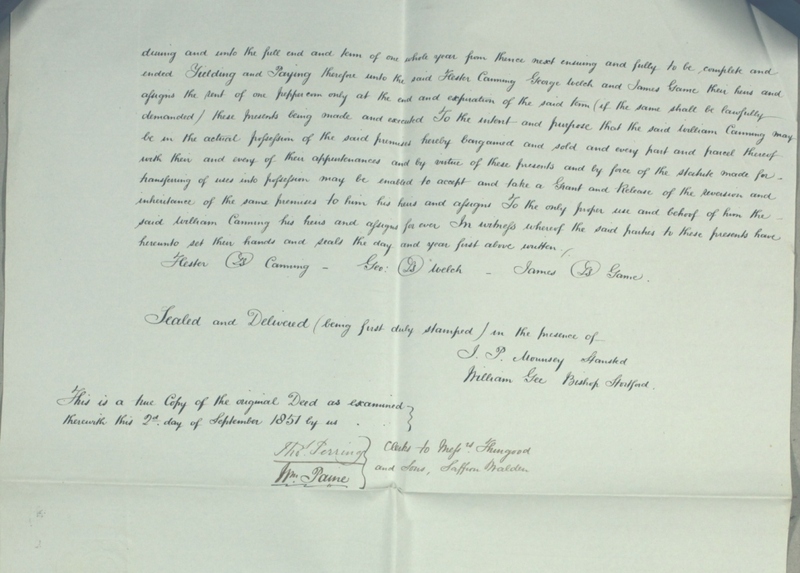 or his under-tenant the said Emma Nottage was admitted tenant on or about 17th July 1833 by virtue of a bargain of sale. 27th July 1899 Benjamin North Ward then of Stone House, Henham, retired farmer, appointed his wife Agnes Mary Ward and Bryan(?) Stickland (?) 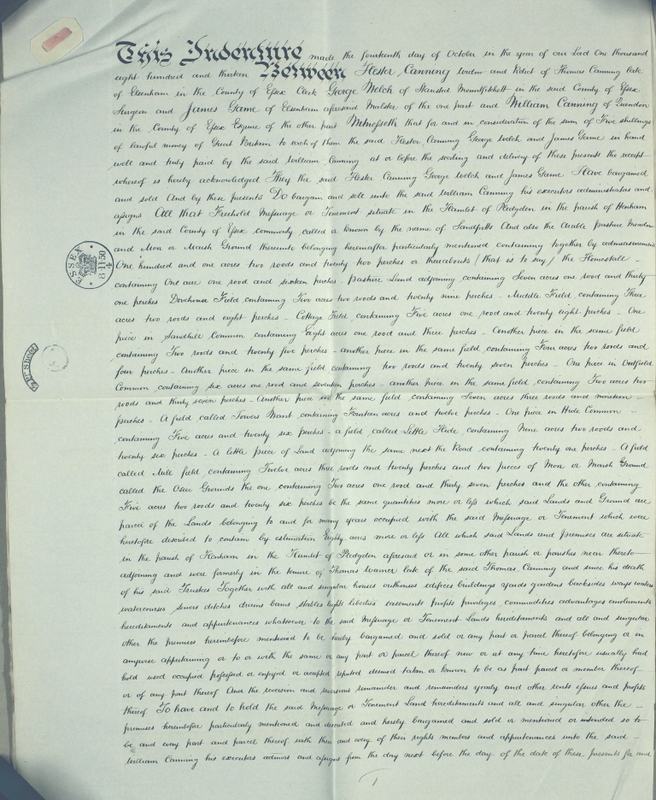 of Bishops Stortford executors and trustees of his Will in which he devises four messuages occupied by himself, William Farrington, James Brooks, William Dennison unto his wife. 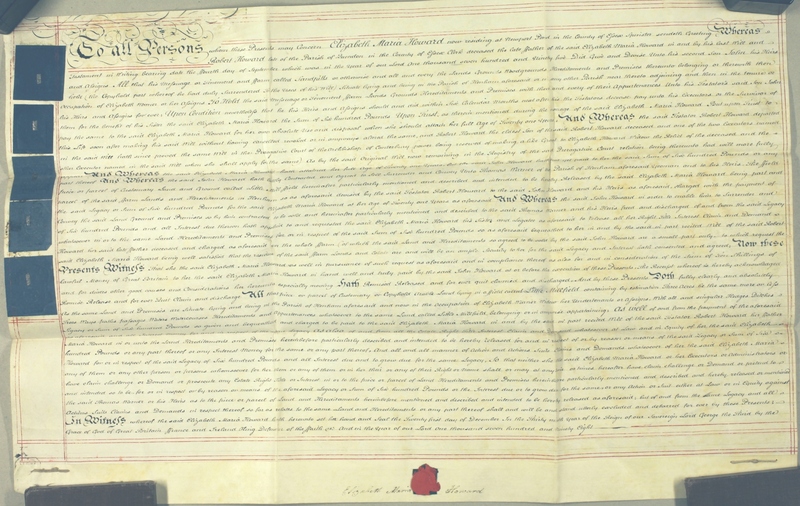 He added Thomas Wright, bootmaker as an executor and trustee. 9 April 1905 Benjamin North Ward died. 8th day of March 1906 between Bryan Douglas Nockolds of the 1st part, Bryan Ackland, Thomas Wright of Henham and William Hayden of Stansted Mountfitchet, blacksmith of the 2nd part and John Balaam of the 3rd part. Balaam paid the others £95 2s 4d. for the tenement in two cottages at Wood End Green. Benjamin North Ward late of Stone House, Henham died 9 April 1905. D/DBi T39 1862-1899 GILBEY FAMILY OF ELSENHAM AND W. AND A. GILBEY, WINE AND SPIRIT MERCHANTS - Deeds of Green End Farm, copyhold of manor of HENHAM Hall, HENHAM including schedule of deeds, 1862-1899. 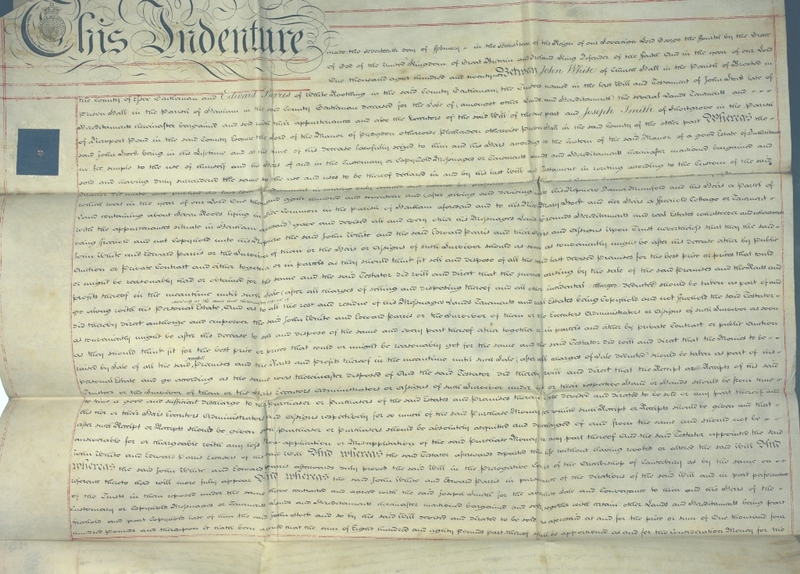 Conveyance from Salisbury Baxendale of Greenend Farm to Sir W. Gilbey dated 24th March 1899.
mentioned: Edward Swinbourne Philbuck, absolute surrender to Joseph Baxendale of a plot of land at Wood End Green dated 20th Feb 1862. 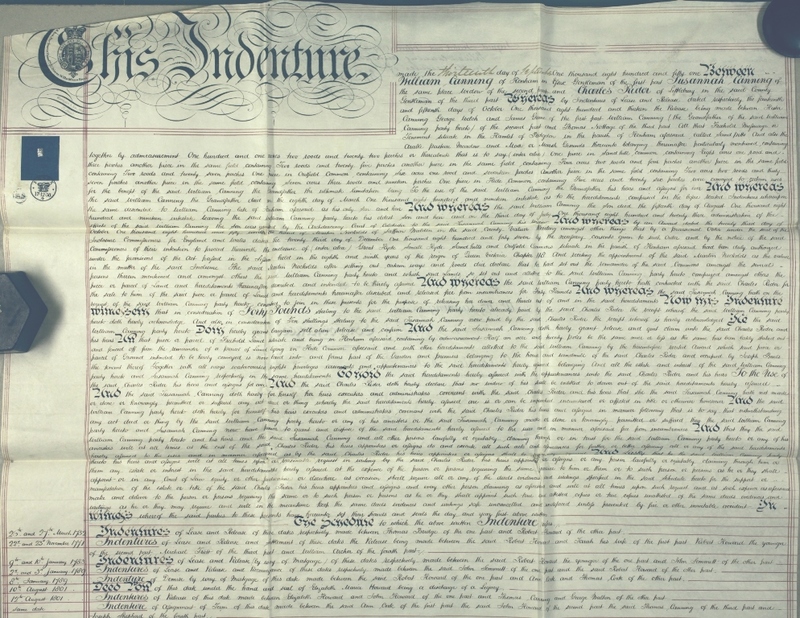 21st May 1862 absolute surrender by Samuel Mole to Joseph Baxendale of a messuage or tenement called ' Gills' at Wood End Green in the occupation of James Brand and William Sage, since of William Sage, John Dennis Snow and others to which said messuage or tenement... the said Samuel Mole was admitted tenant on the 26th March 1850 on the surrender of William Sage. 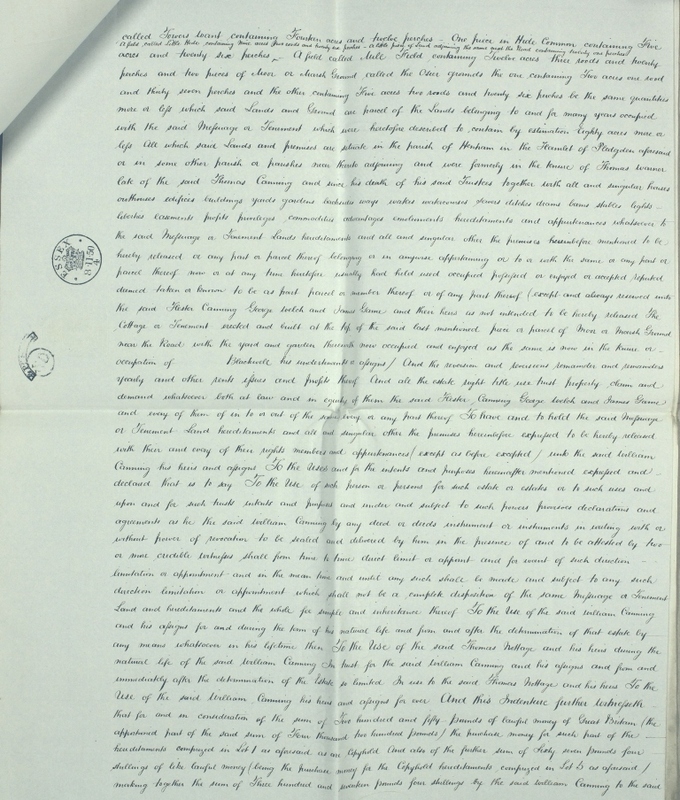 29 May 1862 - John Turner to Joseph Baxendale re a cottage at Wood End Green wherein Mary Dennis formerly dwelt and John Dennis since dwelt and wherein John Rickett doth now dwell and one other tenant wherein Richard Brooks did formerly dwelt and Thomas Dennis since dwelt and which is now uninhabited. 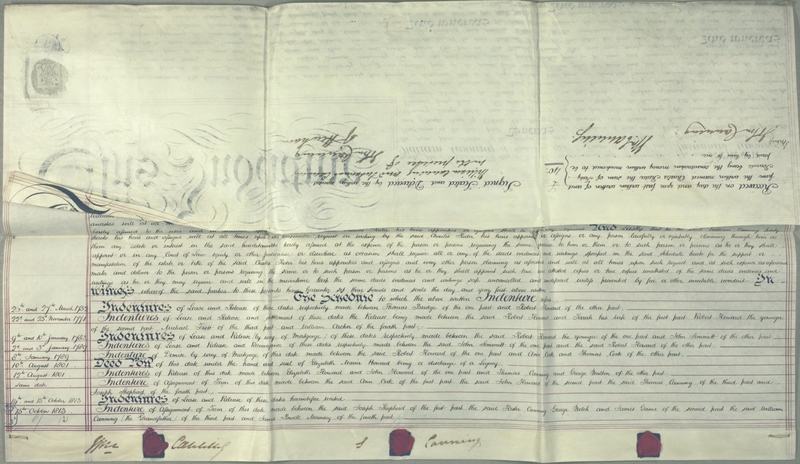 20th Oct 1887 George Franklin Collin absolute surrender to Salisbury Baxendale wherein dwelt Widow Jaques and John Wilkinson then since dwelt then lately in the occupation of Henry Rice and William Carter then of James Hawkes and William Rice then of Henry Brand and William Markwell and now of the said William Markwell and George Barlthorp.